Does your dog chew your shoes? Find out how to stop dog chewing. My Dog Chews Everything – How Do I Stop It? Share the post "My Dog Chews Everything – How Do I Stop It?" So you’ve had it up to here because your dog chews everything, huh? Your dog chews everything from your expensive running sneakers, to the wires in your house. You’ve bought more shoes than you care to count because your dog has chewed the heels off of them. Don’t despair. Chewing is natural for dogs. Even the best trained dogs will chew. The difference between a trained dog, and a dog that chews everything, is that the trained dog has had proper obedience training and knows what’s appropriate to chew on and what’s not. 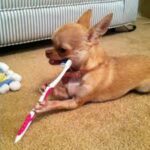 Share the post "How Do I Keep My Dog From Chewing On My Shoes – Stop Terrier Chewing"
I read up on dog chewing problems. And Terrier chewing is quite common across the board. But Terrier chewing behavior needs to be corrected as soon as it’s noticed. 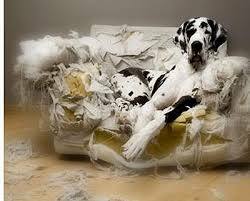 Chewing on furniture, rugs, shoes, and other items is destructive and costly. More importantly, if your terrier starts chewing on wires or electrical cords, it can turn dangerous. Depending upon the age of the dog, you have different alternatives to try and stop terrier chewing. If your terrier is teething, he needs to chew on something because his teeth are coming through. His mouth hurts. It’s sore and may be swollen. He’s trying to gum everything he can get a hold of to make his mouth feel better. If you don’t have a rope toy for him, get one. Soak it in water, place it in a plastic bag, and freeze it. When your puppy needs to chew, make sure you corral him into a small easily mopped up floor space and give him the frozen rope. The cold will soothe his mouth and the rope will last forever. Soft chew toys can also be placed in plastic bags and frozen. These don’t tend to stay cold for very long once they are removed from the freezer, however, it’s a fast and easy solution for when your puppy needs to chew on something immediately. As soon as you see your terrier chewing on something he shouldn’t be, correct him with a firm “No” and remove him from the item. Replacing the item with a squeaky toy, ball, or chew toy will usually redirect his attention. Another method that many have success with is using a “no” can. Fill a clean empty aluminum can with a few pennies or pebbles. Place a few of these cans around the house where they can be easily accessed when needed. When you see your terrier chewing, immediately reach for a no can and give it a quick shake. You will need to firmly tell your dog “No” at the same time. The noise will startle your terrier and he will stop chewing. Remove what he was chewing and replace the item with one of his chew toys. It will not take your dog many times before he will associate the shaking of the can with the negative habit of chewing. There is a product readily available called bitter apple that most dogs intensely dislike. It comes in a spray bottle. If you have caught your terrier chewing on the wooden couch leg, then you would spray the leg with the bitter apple liquid. This product will not harm dogs, however, many dogs dislike it so much that they stop chewing where the spray has been applied. Many owners spray hanging wires and electrical cords with this solution as a preventative measure. Share the post "Ways to Stop Dog Chewing"
Having a dog with a tendency to chew on things that it isn’t supposed to can be one of the most frustrating situations to be in. On one hand, you love your puppy and he or she brings a ton of joy to your life. On the other hand, you would do just about ANYTHING to stop dog chewing! What’s a good dog owner to do? If you’re trying to stop dog chewing, one thing NOT to do is to get overly upset and worked up. Dogs can sense energy, and if you get stressed because your puppy chewed a pair of your favorite shoes, your animal will feed off of your anxiety, which could cause the chewing situation to become worse. Instead, take a firm (but kind!) approach to your dogs chewing habits. Your pup will appreciate that you are “being the pack leader” and giving direction on what to do and what not to do. One great way to stop dog chewing is to replace bad-to-chew item with items that are okay for your pup to chew on. If you see your dog with something like a shoe, a child’s toy, or other item that doesn’t belong to him, you must act quickly. First, tell him “No.” in a very firm (but not yelling) voice. Take the item away from him and repeat the word “No.” Then, once he has calmed down, show him a bone, piece of rawhide, or one of his toys. Make him sit down, and once he is calm, let him take it from you in a gentle manner. As he begins to chew what you gave him, praise him. This will help him to understand that he is only to chew items that you give to him, things that belong to him, and that he can even be rewarded for doing so! Another way to stop dog chewing is to use a chemical chewing deterrent. If you see that your dog has a particular item or place that he likes to chew on, this deterrent spray will help keep him away. Sold in pet stores, online, and in most grocery stores, the deterrent is a bitter tasting spray (sometimes flavored like a bitter apple) that will make an item unappealing to your dog. If you want to stop dog chewing once and for all, contact a local dog trainer. They will be in the best position to determine the root of your dog’s chewing and help you understand how to stop the behavior for good. This will definitely help both you and Fido live happier, healthier lives. My Dog Chews Everything - How Do I Stop It?